Grace Church is affiliated with the Christian Reformed Church in North America , a branch of the Protestant Reformation which began in the Netherlands. Canadian soldiers liberated the Netherlands at the end of World War II; perhaps in response, many Dutch families chose to leave their war-ravaged homeland during the 1940s and 50s to start a new life in Canada. As early as 1954, a group of these immigrants in Northumberland County met to worship in a vacant United Church building in Wicklow. In 1955, to attract more immigrant families living in the Port Hope area, they moved to rented facilities in Cobourg. Within 10 years they had outgrown their rented hall, and found a site for a permanent building at 440 King Street East in Cobourg. The project moved quickly. 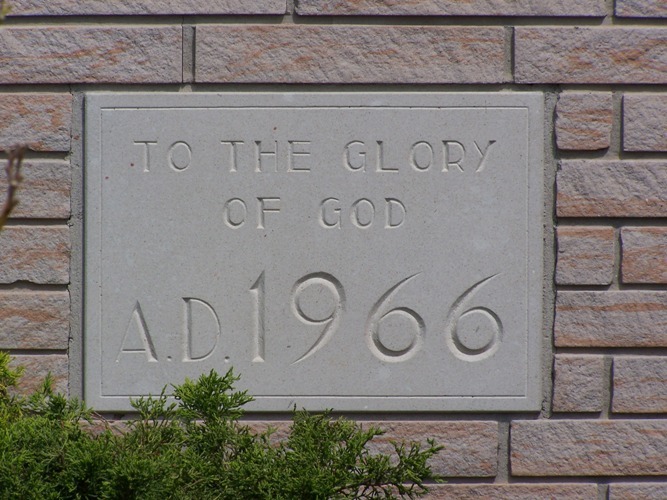 The church bought the property in May 1966, laid the cornerstone in September that year, and dedicated the new building just as Canada entered its centennial year – January 5, 1967. More than 360 people attended the dedication! That building at 440 King Street East – with the addition of a large fellowship hall and meeting rooms in the 1990s, and a renewed and about-turned sanctuary in 2014 – continues to provide a worship home for Grace Christian Reformed Church. However the congregation looks very different from that group of new immigrants from Holland gathering in Wicklow 60 years ago. Marriages, friendships, and outreach programs have brought many Canadians from non-Dutch backgrounds into this fellowship of Christians. Twelve pastors have served the congregation at Grace during its first sixty years; current pastor Allan Kirkpatrick is the first without any Dutch ancestry.